DELTA is a 1.5 GeV synchrotron light source operated by the TU Dortmund University for internal and external users as well as for research in accelerator physics. The pulse duration of synchrotron radiation is given by the typical bunch length in electron storage rings of several 10ps to 100ps (FWHM). In novel X-ray free-electron lasers (FELs), pulses as short as 10 fs are obtained, but to-date only four of these single-user facilities are in operation while about 50 synchrotron light sources serve multiple users simultaneously. It is therefore worthwhile to investigate methods to extend the capabilities of these conventional light sources towards shorter pulse duration. 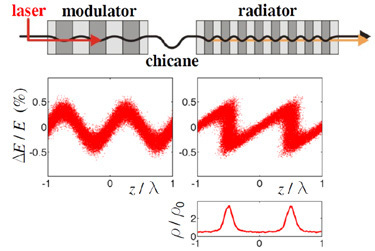 Figure 1: Principle of CHG with laser-induced energy modulation (?E/E versus z in units of the laser wavelength λ) in an undulator (modulator), micro-bunching in a magnetic chicane, and coherent emission of laser harmonics in a second undulator (radiator) . Coherent harmonic generation (CHG) is a method to generate coherent radiation pulses which are about 1000 times shorter than the electron bunch length. Here, a femtosecond laser pulse co-propagates with the bunch through an undulator (the “modulator”, see Fig. 1), a magnetic structure with alternating field. The laser-electron interaction causes a periodic energy modulation within a short “slice” at the center of the bunch. In a subsequent arrangement of dipole magnets (“chicane”) the energy-dependent path lengths of the electrons convert the energy modulation into a periodic variation of the charge density (“micro-bunching”). In a second undulator (the “radiator”), the micro-bunches give rise to coherent and ultrashort radiation at harmonics of the laser wavelength, and this pulse is more intense than the incoherent radiation emitted by the rest of the electron bunch. The CHG method was first demonstrated in 1984 at the storage ring ACO in France  and later applied at other places. Since 2011, CHG is tested and further developed at the DELTA short-pulse facility shown in Fig. 2. Figure 2: Short-pulse facility at DELTA comprising a laser system, the beamline BL 3 sending laser pulses to the undulator U250, the diagnostics beamline BL 4, the soft-x-ray beamline BL 5 used for pump-probe experiments, and the terahertz beamline BL 5a ..
At DELTA, the CHG pulses are generated at a rate of 1 kHz, which is the repetition rate of the Ti:sapphire laser system employed here. Since the revolution frequency of a single bunch in the storage ring with 115.2 m circumference is 2.6 MHz, each CHG pulse is followed by about 2600 incoherent pulses and its detection requires either an intrinsically fast detector, such as a photodiode, or a gated device. Imaging is important for several characterization tasks, e.g. 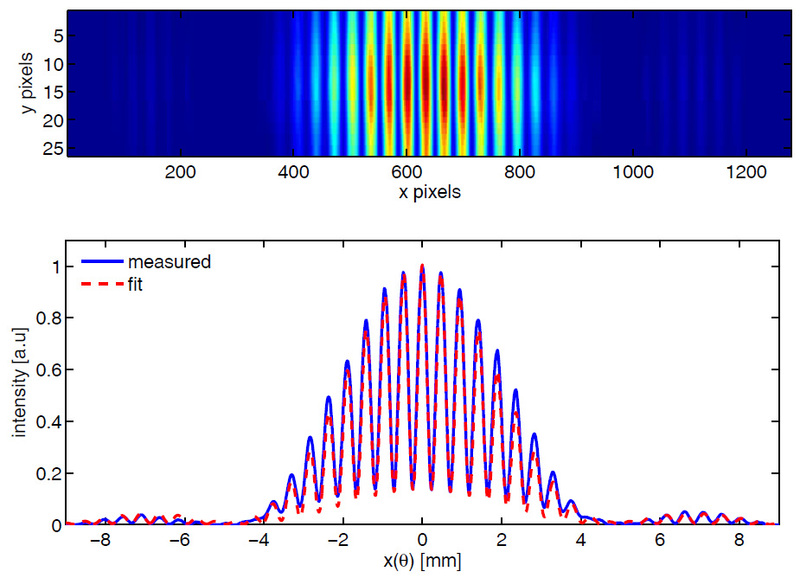 to determine the angular distribution of CHG pulses, to record a singleshot spectrum, or – as shown below – to image interference patterns generated by this type of radiation. For this purpose, a fast-gated image-intensified CCD camera with a minimum gate time of 2 ns  was installed (iStar DH334T-18U-E3 from Andor Technology). Figure 3: Interference fringes of CHG radiation from a double-slit experiment . Figure 3 shows an interference pattern formed by CHG radiation passing through two slits. The transverse coherence length is obtained by recording these patterns under variation of the slit separation . As for the temporal coherence length, two methods were employed. First, the double-slit experiment was modified by placing movable glass wedges after each slit, thus introducing a delay between the light from the two slits. A delay beyond the coherence length causes the interference pattern to vanish, as shown in Fig. 4 . The second method involved a Michelson interferometer obtaining a similar result, i.e. a temporal coherence length of about 34 fs for CHG radiation and 10 fs for incoherent undulator radiation filtered by narrowband mirrors required for background suppression. Without these mirrors, the result for CHG would be the same, while the coherence length of incoherent radiation would be even shorter. Figure 4: Visibility of interference fringes of CHG radiation (left) and of spontaneous undulator radiation (right) in a double-slit experiment as function of the delay between light from the two slits . The CHG characterization experiments described here were made possible by the use of a fast-gated ICCD camera. At wavelengths as short as 200 nm, these cameras are prone to artifacts from UV radiation reaching the camera sensor. In the present case, this effect was successfully suppressed using the IntelligateTM option which simultaneously gates the photocathode and the micro-channel plate . S. Khan et al., Synchrotron Radiation News 26(3), 29 (2013). Andor iStar 334 specification sheet, www.andor.oxinst.com. M. Huck, Dissertation, TU Dortmund 2015. Andor iStar ICCD brochure, www.andor.oxinst.com.